Welcome to Isaiah 32, I hope you enjoy reading this book. But before we get right into Isaiah 32 let us give homage to our Lord and savior Jesus Christ and after doing this we can read Book of Isaiah . 32 A king will come who will do what is right. His officials will govern fairly. 32 A king will come who will do what is right. His officials will govern fairly. 2 Each man will be like a place to get out of the wind. He will be like a place to hide from storms. He’ll be like streams of water flowing in the desert. He’ll be like the shadow of a huge rock in a dry and thirsty land. 3 Then the eyes of those who see won’t be closed anymore. The ears of those who hear will listen to the truth. 4 The minds of thoughtless people will know and understand. Tongues that stutter will speak clearly. 5 Foolish people won’t be considered noble anymore. Those who are worthless won’t be highly respected. 6 A foolish person says foolish things. His mind is full of evil thoughts. He doesn’t do what is right. He tells lies about the Lord. He doesn’t give hungry people any food. He doesn’t let thirsty people have any water. 7 The one who is worthless uses sinful methods. He makes evil plans against poor people. He destroys them with his lies. He does it even when those people are right. 8 But the man who is noble makes noble plans. And by doing noble things he succeeds. 10 You feel secure now. But in a little over a year you will tremble with fear. The grape harvest will fail. There won’t be any fruit. 11 So tremble, you contented women. Tremble with fear, you who feel so secure. Take your fine clothes off. 12 Beat your chests to show how sad you are. The pleasant fields have been destroyed. The fruitful vines have dried up. 13 My people’s land is overgrown with thorns and bushes. Sob over all of the houses that were once filled with joy. Cry over this city that used to be full of wild parties. 14 The royal palace will be left empty. The noisy city will be deserted. a dry and empty desert forever. Donkeys will enjoy being there. is poured out on us from heaven. Then the desert will be turned into rich farm lands. The rich farm lands will seem like a forest. people will do what is right. And they will treat one another fairly. 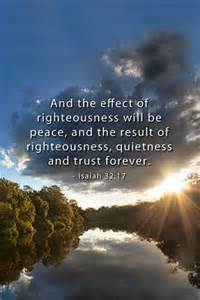 17 Doing what is right will bring peace and rest. and trust in the Lord forever. 18 They will live in a peaceful land. Their homes will be secure. They will enjoy peace and quiet. 19 Hail might strip the forests bare. Cities might be completely destroyed. 20 But how blessed you people will be! You will plant your seeds by every stream. wander anywhere they want to.